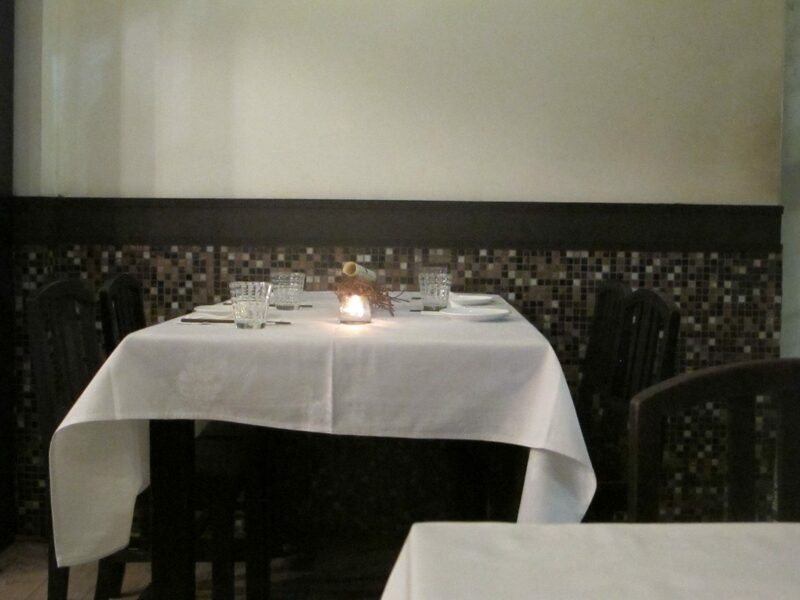 Donna Wheeler reviews the Yin Yang Kitchen, Hong Kong – a great place to begin the Chinese Year of the Dragon. Wan Chai might be better known for its bankers and girlie bars, but its streets still turn up some beautiful examples of Hong Kong’s unique 19th and 20th architecture. It’s in such a building, a listed Grade II Heritage tong-lau or early 20th-century tenement, that Margaret Xu Yuan, one of Hong Kong’s most interesting chefs welcomes her guests. With only three tables downstairs, an upstairs room for the occasional large booking and a tiny kitchen spliced in between, this is a uncommonly calm and intimate space in a city better known for its showily high-octane dining scene. But the room is quintessentially Hong Kong, and sets the scene for food that also honours and reimagines the city’s many-layered cooking styles, and captures its true culinary heart. A plate of starters feels like a voyage of discovery; time to get your bearings. There’s an emblematic black and white tofu bathing in a seaweed brine, then small bites of various vegetable – a small baton of eggplant with lychee vinegar and fried shiso leaves, a sweet picked cucumber, a slice of fig on a cube of corn ‘cheese’. A slice of salted black pork belly, served with a garlic and wine vinaigrette, is an earthy delight, followed by the complex package of sea urchin and mango in a chicken stock jelly bubble, then drizzled with organic honey. Sea whelks, as varied as a haul of seashells from a day at the beach might be, fill a vase of sea water spiked with chilli. These are procured by local divers, and are only taken from the freshest waters of the South China Sea. The meat is plucked out with a little wooden spear, each a new discovery: a succulent meaty slab, another a tough but highly flavoured nugget, some are like the most silken mussel. A spiky pod is cracked open to reveal a nut – an English translation hasn’t been found but it seems to be vaguely related to the chestnut – and sits next to a mound of briny sea salt. It’s a fairytale like offering, a fabulously elemental pairing. Yuan grows much of the produce at her own organic farm in the New Territories; she explains that the Hong Kong palette has become jaded by too much MSG, salt and spices so her dishes are an attempt to reinject an interest in the produce itself, its essential flavours and qualities. Her cooking methods also speak of a less is more philosophy, with many of Yin Yang’s signature techniques gleaned from Yuen’s country neighbours. Yuen has adapted the Hakka housewives traditional stone grinders and clay and charcoal ovens for a commercial urban kitchen. These methods come to the fore in her signature mains. Diners can choose aher Yellow Earth chicken, a supernaturally crispy whole bird, Jade perch with seaweed jelly cubes or taro crust or sea lettuce depending on the season, or Red Hot – a baby pig. If its pork, a fat little leg will appear for inspection before it’s whisked away to reappear simply chopped into a pile of fleshy chunks, with just a jammy, musky lychee sauce on the side. The leg is roasted with the bone in, its rippling crust of volcanic crisped skin giving way to sweet succulent flesh. Like the whelks, Yuen likes to the source of her produce – the pigs that end up on her plates are raised by a farmer who feeds them traditional organically-grown foods, supplemented with Chinese medicine herbs. Any Chinese banquet worth its salt will contain a crab dish and Yin Yang’s menu is no different. Here, there’s three components. The crab’s exsected shell flavours a dish of egg white and young coconut meat, a dish of such haunting, ethereal beauty, it’s hard not to feel emotional or nostalgic when trying to recall it. But a side of organic rice, unctuous with fruity olive oil and studded with wilted dark green herbs, brings you back to earth. Not to be overlooked, is the flesh-flecked soup: dense, gelatinous and salty, yes, Cantonese to the core. To finish, Yuan’s desert speciality is her contemporary take on traditional ground rice cakes, but on this blistering mid-summers night, there is, instead, a ball of lemongrass ice cream, organic of course, richly yolky and intensely fragrant. Simple enough and simply enough. Theatre undoubtedly plays apart in the Yin Yang experience, with Yuan’s highly lyrical presentation, her elegant staff’s hushed hands-on dealings with the meat courses and the low lit dining room. But her cooking itself is far, far away from the trickery of the global gastronomic chemistry set. There’s an almost brutal honesty to it, the powerful primal sensual presence of each dish jolting you out of the cerebral realm. Every mouthful demands your complete attention, and for this diner at least, a rather joyous meditation. The crab course I loved so much was served on a fine china plate declaring ‘more please’ in neat blue san-serif type. After such a feast you definitely won’t be wanting more, but Hong Kong, in fact the world, really does need more chefs like Margaret Xu Yuan. Donna Wheeler is the author of several Lonely Planet guidebooks, is a reporter for My Art Guides and the author of the upcoming Paris Precincts title for Hardie Grant. She has published on contemporary art, architecture and design, food, wine and history in a variety of publications. Travel writing follows various careers, including commissioning editor, art director, digital producer and content strategist.